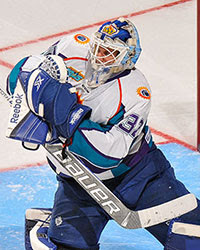 Orlando, FL – The Orlando Solar Bears, proud affiliate of the NHL’s Toronto Maple Leafs and AHL’s Toronto Marlies, announced their playoff roster for the 2015 Kelly Cups Playoffs, presented by Auto Justice Attorney Michael T. Gibson. Tickets are on sale now, and can be purchased at www.OrlandoSolarBearsHockey.com,www.Ticketmaster.com, or at the Amway Center Box Office. The Solar Bears may add up to four more playoff- eligible players to reach the 23-player maximum. a list of all other Players who meet the Playoff Roster Eligibility requirements, but who are unavailable at the time that Playoff Rosters are due to the League Office due to recall to the AHL or NHL. The Playoff Eligible List may only list Players who are unavailable due to recall. All other players (i.e. injured Players) must be listed on a Member’s initial Playoff Roster (active roster or reserve list) in order to participate in the Playoffs.